Mrs. Clarks 7th grade social studies woking on achieving manifest destiny! Students in Mrs. Clarks 7th grade social studies woking on achieving manifest destiny by working through the Oregon Trail. 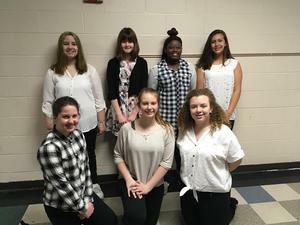 Congratulations to all of our vocalists and musicians! Congratulations to all of our vocalists and musicians that earned the 2nd highest rating at an OMEA event yesterday! Thanks to Mrs. Petty for her dedication and extra time invested to our students! First grade students presented the musical "Wing It! 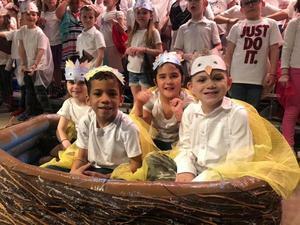 First grade students of Mrs. Eickenhorst, Mrs. Lay, Mrs. Meiers and Ms. Shinkle's classes presented the musical "Wing It!" They did such a great job! Congratulations to Mrs. Petty and her talented students on a fantastic performance! Our next batch of birdies are about to take flight! Congratulations to Mrs. Petty and her talented students on a fantastic performance! Spring in definitely in the air at Goshen High School! Several photos from last week. Spring in definitely in the air at Goshen High School! 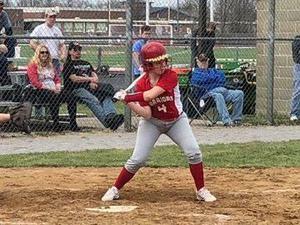 Goshen High School newsletter for the week of 4-8-19! 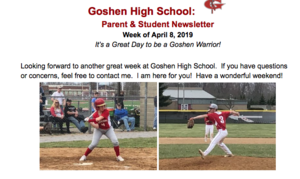 Goshen High School newsletter for the week of 4-8-19. Have a great day! Spaulding‘s third graders are pumped up for their AIR assessments! Spaulding‘s third graders are pumped up for their AIR assessments, which will begin this week! Third grade will complete their Reading assessment on April 10-11 and their Math assessment on April 24-25. We celebrated their hard work at a pep rally this afternoon. What a great week at GMS! 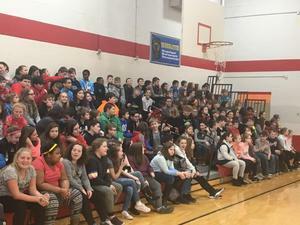 What a great week at GMS! We celebrated the preparation that has taken place in each grade level with our staff and students. Celebrations included assemblies, games and encouraging messages throughout the building. SENIOR FAMILIES: Are you ready to upgrade your graduation seats? SENIOR FAMILIES: Are you ready to upgrade your graduation seats? The Goshen Education Foundation will be selling $10 raffle tickets. The winner will receive 10 front row tickets for graduation. WOW! Purchase your tickets today! !